ION iCade Arcade Bluetooth Video Game Cabinet for iPad. Shipped with USPS Priority Mail. 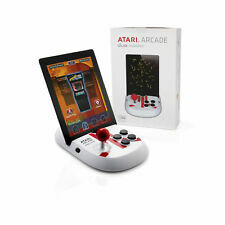 ATARI ARCADE DUO POWERED Made for Ipad NEW!!! ATARI ARCADE DUO POWERED Made for Ipad NEW!!!. Condition is New. Shipped with USPS Parcel Select Ground. See column to the right. Either new or barely used. Excellent condition. Includes only what is pictured - iPad is not included. Actual color may vary due to lighting conditions. I know it works on an ipad 2. it doesn't say it what models it is for just ipad. Unleash your inner arcade champion with iCade Core. Challenge your friends, throw retro-gaming parties and achieve your highest scores yet. iPad Atari Arcade game. Brand New. Joystick controller. Duo Powered. Download and play Atari Greatest hits. No batteries required. The Arcade has a plastic, oval-shaped dock with the red Atari logo painted over a clean white plastic finish. All the action takes place on four black buttons and a protruding spherical joystick whose bright red color would give Ronald McDonald's nose a run for its money. Connect Atari Arcade directly into your iPad and download the Atari app. The app is designed for one or two players. Atari Arcade - Duo Powered brings Atari's arcade classics right to your iPad. Simply connect your iPad to Atari Arcade, download Atari's Greatest Hits app for Duo, and you're ready to share the fun with family and friends anywhere! Go old-school in a new-school way. The Atari Greatest Hits app for Atari Arcade is designed for 1 or 2 players. It's easy to get started. No batteries are required--just connect and play. Atari Arcade Duo Powered Ipad 1, 2, 3 joystick controller. Condition is New. Shipped with USPS Priority Mail. Atari Arcade-Duo Powered brings Atari's arcade classics right to your iPad. Simply connect your iPad to Atari Arcade, download for Duo, and you're ready to share the fun with family and friends anywhere! ATARI ARCADE DUO POWERED. (Ipad not included). never played with! for your buying consideration New Parts are parts that have never been played with and were obtained from reputable sources. You can add parts to your original order if it has not reached 'Processed' Status. You are purchasing an ATARI ARCADE duo powered. Works with ipad, 1 2 & 3. ATARI ARCADE JOYSTICK CONTROLLER FOR IPAD. GAME. REMOTE. ACCESSORY. I-Cade Core 100+Games NIB Compact Arcade Controls For I-Pad Games! ION iCade Core compact arcade-style controls for hundreds of iPad games (iPad is not included) is in excellent new condition in the box. It has full sized controls and you can charger your pad while u play! You can also use Bluetooth. Please email me with any questions and look at my other great items for sale. Please pay within 3 working days. I will ship your item out when I receive payment. I am sorry, but I do not accept refunds, checks, or e-checks. Go old-school in a new-school way. The Atari Greatest Hits app for Atari Arcade is designed for 1 or 2 players. Atari Arcade-Duo Powered brings Atari's arcade classics right to your iPad. Simply connect your iPad to Atari Arcade, download for Duo, and you're ready to share the fun with family and friends anywhere! Never Opened. See pictures for details. ATARI ARCADE Duo Powered Joystick Controller. For iPad 1/2/3 Gen. Brand New! PREOWNED IN GOOD WORKING CONDITION. NEEDS NEW BATTERIES. VERRY NICE! BRAND NEW Atari Arcade Duo Powered Joystick Controller for iPad 1 2 3 SHIP FAST! Atari Arcade. Every item is described in detail and each item is sold "as is" with no implied or inferred warranties or claims. The Atari Greatest Hits app for Atari Arcade is designed for 1-2 players. The item itself is in good condition, ready for play, as shown in the pictures.